What is the best time to study? Honest advice! As there are so many different ways to study, so there different times to study. Many students are wondering when is the best time to study and if there is any correlation between the time you choose to study and the amount of work you will be able to pool. We have found no scientific data to prove that time of the day is better, so it is mostly about what time works best for you. 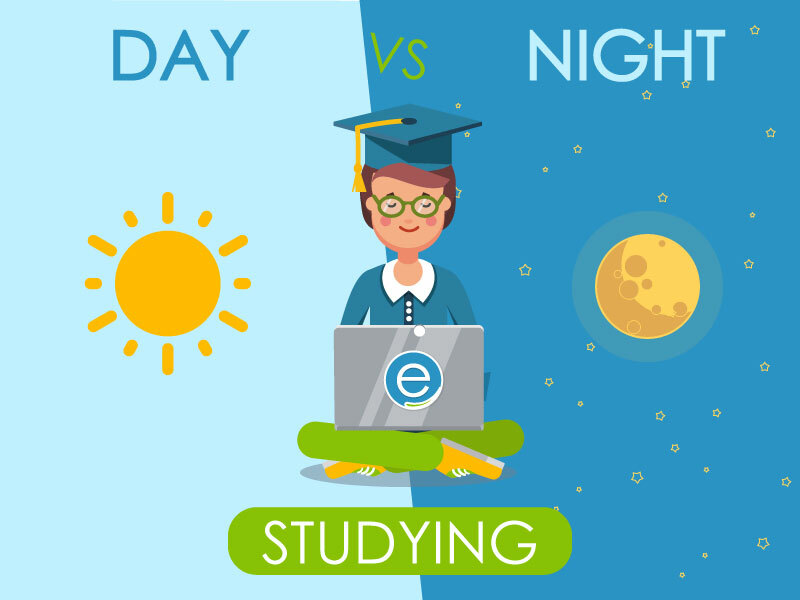 To be objective, we decide to list benefits of both day and night study as well as some helpful advice on both. a great time for creative thinking and dealing with innovative tasks. sleeping after studying can help you recover faster. When is the best time to study according to science? Considering several studies all around the world, the brain usually works best in the morning, after a good sleep and nutritional breakfast, however, we need to understand there is no certain timeframe for ‘morning’. Some people are capable of running their errands and studying since 7.30 a.m. while others have to wait till 11 a.m. to be able to operate. Limit your distractions. You will be often disrupted by notifications from your social media or people buzzing around. Mute the sound and get good headphones. Get caffeinated only if you need it. Many people have a habit of sipping a coffee at all the times doing any reading. Use your coffee as an emergency tool only. Get a place with less distraction factor. Despite the myth, the coffee shop is not the best place to study. Look for the quiet place with a big table (so you could lay down your books and notes). Lit things up. Have a good lightening helps you focus and not fall asleep on the first possible occasion. This will also help you maintain your eyes’ health. Manage your time. It is so easy to lose track of time, so make sure you set regular alerts on your phone (use Timer or apps like Flat Tomato (time management) to help you out. Stay hydrated. One of the reasons you may feel sleepy is a dehydration. Provide regular water intake to get you through the night. Have enough sleep during the daytime. If you are a night owl, make sure you have time to rest/sleep during the day. Best time to study is what suits you best. Take time to watch yourself and establish your perfect routine. No matter what time of the day you choose to study, make it healthy and reasonable so you could actually survive until your graduation.